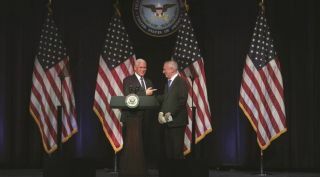 U.S. Vice President Mike Pence (left) and Defense Secretary James Mattis share a light moment during the Aug. 9 rollout of the Trump administration's plan for establishing a Space Force. LOS ANGELES – During a White House meeting on Nov. 29, Pentagon and administration officials discussed the possibility of establishing a Space Force under a larger Department of the Air and Space Force. A DoD spokesman confirmed to SpaceNews that a team of Pentagon officials led by Deputy Defense Secretary Patrick Shanahan floated this idea to Vice President Mike Pence, who leads the administration's space reorganization efforts. Shanahan is overseeing the drafting of a legislative proposal that will be submitted to the White House in the coming weeks and, once approved, will be sent to Capitol Hill with the president's budget request for fiscal year 2020. The president has been insistent that a Space Force should be a completely independent military department. A draft policy directive — known as Space Policy Directive 4 — has been in the works for weeks. According to a version of the policy dated Nov. 19, the Pentagon would be directed to propose a Space Force as a separate military branch with its own civilian leadership. A White House spokesperson said the Nov. 19 draft memo is "subject to change, and the Space Council continues to work with the departments and agencies responsible for carrying out President Trump's direction to establish the U.S. Space Force as a sixth armed service." The spokesperson insisted that "the direction to create the U.S. Space Force remains exactly the same" and no alternatives would be acceptable. The challenge for the White House, however, is ensuring the proposal gets enough congressional support so it is not dead on arrival. Democrats are widely opposed to establishing a new service. Even White House ally Sen. James Inhofe, chairman of the Senate Armed Services Committee, has told Trump that he is skeptical about the need for a new service and concerned about the cost, according to media reports. The cost of a new service is driven by its scope. A fully independent department with its own overhead would be dramatically more expensive than one that is organized under an existing department, like the Marine Corps which is in the Department of the Navy. DoD would not call the space service a Space Corps, as Space Force is the name the president wants. The House of Representatives last year passed legislation that would have created a Space Corps within the Air Force but the bill did not make it past the Senate. If the Space Force is organized as part of a broader department for air and space, the thinking is that more lawmakers would back the plan, especially those on defense committees who want to see more focus on space as a national security issue. The legislative proposal would have to be specific about the scope of the Space Force as that would determine how much money the Pentagon has to request in next year's budget.